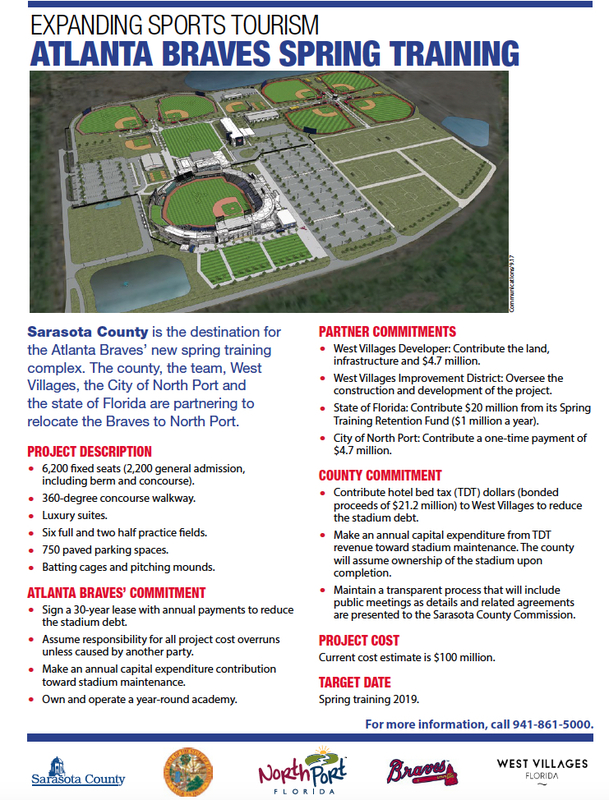 On March 8, 2016, then-Sarasota County Commissioner described the prevailing attitude as “cautionary excitement”: The board was preparing to authorize County Administrator Tom Harmer to negotiated with the West Villages Improvement District and the Atlanta Braves in an effort to entice the team to relocate its Spring Training operations to the North Port community. It will be up to the North Port City Commission on Sept. 19 to drop the final piece of the proverbial puzzle in place for the team move to become a reality. 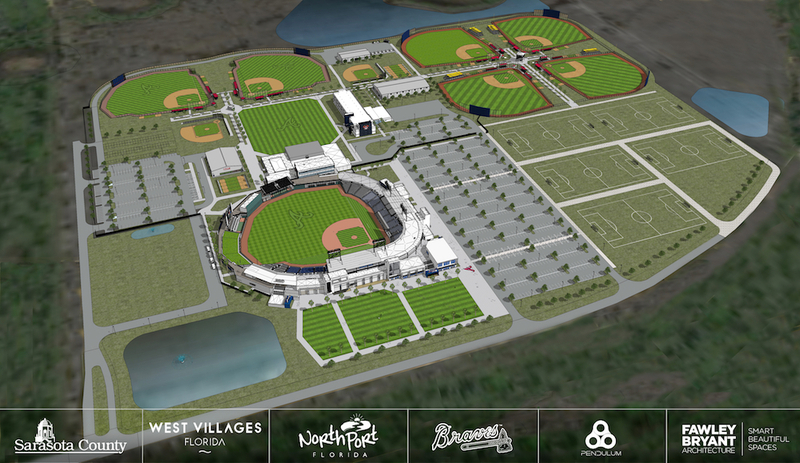 Nonetheless, on Sept. 13, both the County Commission and the West Villages Improvement District board gave their approval to the last formal document necessary to enable the Braves to start Spring Training in the West Villages in 2019. On a Sept. 13 motion by county Commissioner Alan Maio, seconded by Commissioner Charles Hines, the board unanimously signed off on the development agreement that includes the City of North Port, the West Villages Improvement District, the Calben Corp. — developer of the West Villages — and the Braves. “This has been a long time coming,” Maio said. The cost estimate for the new complex has risen from the $75-million to $80-million range to about $100 million, Harmer reported to the board during its regular meeting that day. At the same time, the Braves have increased their financial commitment to the project, he pointed out. “The Braves will pay all of the fees and costs due under the Design Contract,” along with the first $12.4 million of expenses under the construction contract, for a total of more than $18 million, an executive summary provided to the board explained. The team also will cover any cost overruns for which it is responsible, Harmer noted. Additionally, the Braves will pay the full debt service on the bond issued for the expense of the new facilities, Harmer told the board. As previously noted, the team and the county each will contribute a total of $5,625,000 over 30 years into a capital expense fund for maintenance at the complex — similar to the arrangement the county has with the Baltimore Orioles for that team’s use of Ed Smith Stadium in Sarasota for its Spring Training. Furthermore, the team will pay for all furniture and other equipment, including the scoreboard, he said. The latter item will cost between $7 million and $8 million, he added. The team also will be responsible for the operation and management of the facilities, he pointed out. Provided the North Port Commission approves the agreement next week, Harmer said, “we would expect construction to start rather quickly … over the next week or two,” in spite of Hurricane Irma’s impact on the county. Sufficient prep work has been done, he indicated, to enable the project to get underway. The goal is to have the complex completed in January 2019. The county will assume ownership of the facilities when they reach the point of substantial completion, he reminded the commissioners. Along with the team’s financial commitments, Harmer pointed out, the county will provide $21,262,000 for the project out of Tourist Development Tax revenue, and it will pay $117,000 for title insurance at the time of the transfer of the property. Both the City of North Port and the developer have committed to upfront payments of $4.7 million. 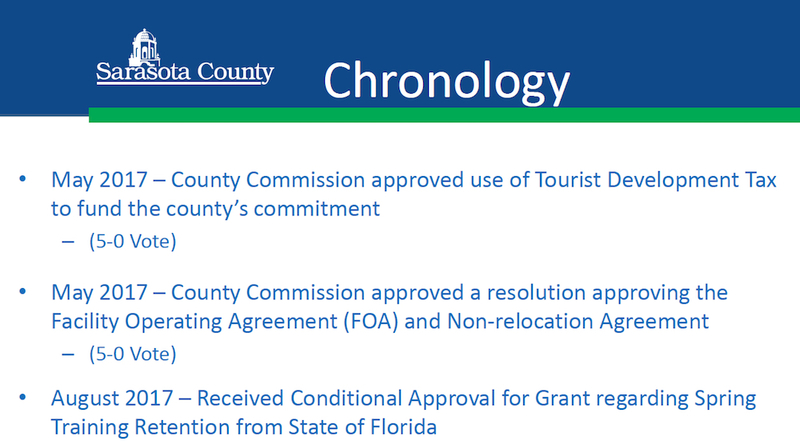 Finally, the state has committed to a $20-million grant from its Spring Training Retention Fund, provided the North Port Commission approves the agreement it will consider next week, Harmer said. That money would come in installments of $1 million per year, he pointed out. The document all parties have to approve calls for a 30-year lease of the facilities to the team, with the option for two renewals of five years each. Therefore, Harmer said, the potential exists for the Braves to remain in the West Villages for 40 years. Each of the lease renewals provides for an annual payment of $250,000 to the county. The County Commission will address two other related matters before the end of the year, Harmer continued. On Oct. 11, the board is scheduled to vote on authorizing the issuance of the county bond for which the Tourist Development Tax revenue will cover the debt service. Then, in December, the commission would approve the final funding resolution for the project. Prior to the vote, Commissioner Nancy Detert asked whether county staff gets to choose who handles the title insurance. 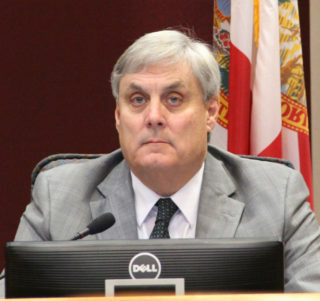 County Attorney Stephen DeMarsh replied that staff had selected the Sarasota law firm of Williams Parker for that work. “They have a long history of understanding the transactions of title on that land,” he added. When Detert asked why the Office of the County Attorney could not do the work, DeMarsh told her, “We don’t do that,” but it will review all the documents. With no other board questions, Maio made his motion to approve the agreement. He was part of the group about 10 years ago that worked to get the Legislature’s approval for the West Villages Improvement District, he explained. “The county was not exactly pleased with that,” he added, because the board members at the time felt they were surrendering some of their authority. The District website explains, “The West Villages Improvement District [WVID] was created by Special Act of the Florida Legislature pursuant to and under Florida Statutes Chapter 189 Special Purpose Local Government Act to assure timely, cost-effective, and high-quality design and implementation of infrastructure for the District located in City of North Port in Sarasota County. “WVID is a limited, single and specialized purpose Local Government whose purpose is to provide infrastructure, including community development systems, facilities, services, projects, and improvements to the District. The area governed by the District is approximately 11,000 acres. 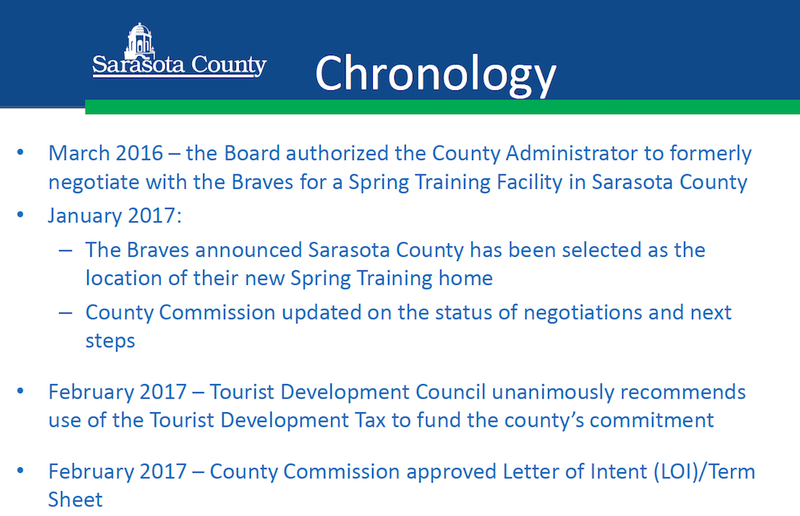 That bonding ability, county staff has explained, has been key to the Braves project, “with a lot of the expenses borne by others,” Maio noted on Sept. 13. “It’s somewhat anticlimactic to be here today,” Commissioner Hines added. “We’re not waving banners and wearing jerseys,” as audience members did last year, when the board discussed whether to authorize the negotiations with the team. 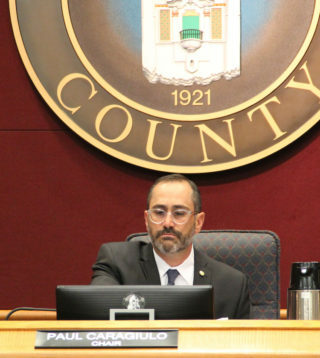 Hines and Chair Paul Caragiulo both pointed to the expectation for significant economic benefits to the county — including increased property values — from having the Braves conduct Spring Training just outside North Port. Hines also stressed that the county’s financial contribution to the deal will come out of its “bed tax” revenue, not its General Fund, which pays for so many county operations. Moran added that he also is pleased by the prospect of career creation in conjunction with the year-round players academy the team plans at the complex. That will help diversify the county’s job market, Moran pointed out, with the hiring of people who have specialized in sports medicine and rehabilitation. Commissioners also extended thanks to Martin Black, chair of the West Villages Improvement District, and Jeff Maultsby, director of business and economic development for the county.